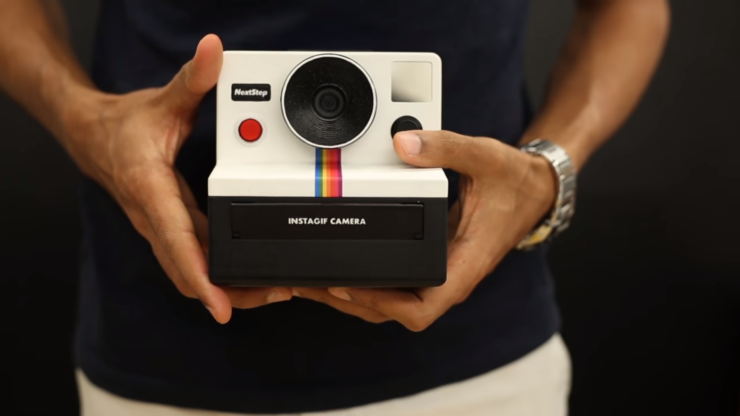 Someone Made a Polaroid Camera That Can Print GIF's (sort of) | OhGizmo! By Randy Donack on 09/04/17 • Leave a comment! People these days seem obsessed with bringing back old tech whether it be vinyl records, retro video games, or old film cameras. And as far as old cameras go, no company seems gets the rose-colored nostalgia treatment quite like Polaroid. I suppose there’s nothing quite as satisfying as taking a picture and having it print out into your hands seconds later. Well Reddit user, abhi3188, decided to combine the look and feel of the old Polaroid camera, with the modern equivalent of communication, making a camera that prints out GIF’s. The project, named the Instagif NextStep, works by taking a short clip with the camera, which it then ‘prints’ out a cartridge with a small screen on it to display the GIF. Okay, so it doesn’t magically print moving images onto film paper, but it’s still a super cool idea. Once released the GIF even takes a second to fade in, like a real photo from an instant camera. The project looks incredibly complex and was built entirely from scratch, including a mechanism for loading and unloading the cartridge and requiring separate batteries to power the camera and the cartridge. If you’re interested, the creator also posted a DIY album detailing its construction. For me, I’d rather stick with my vinyl records which are less convenient, more time-consuming, way more expensive, but way more fun than using Spotify.